A 24" Geppetto and a 17" Pinocchio are available both with 13 moveable joints. As an added bonus Pinocchio and Geppetto also have internal music boxes. The delightful Talking Cricket stands 9" tall and also has 13 moveable joints. 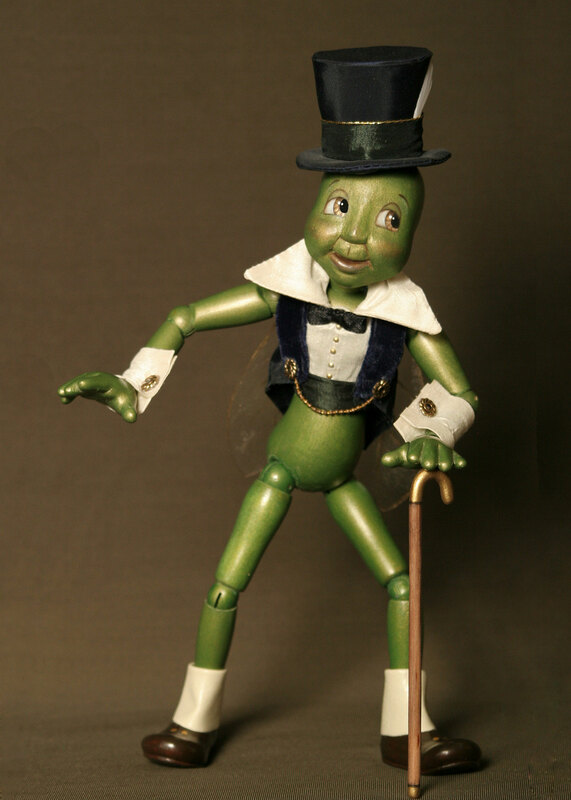 He is elegantly dressed in a tuxedo and top hat comes packed in a small wooden box. 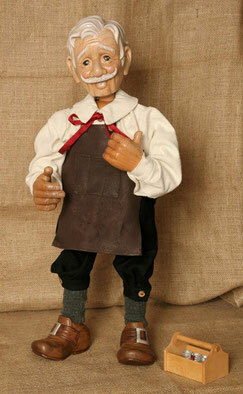 Geppetto's head, hand and shoes are carved from Western maple. His shoes are stained to give them a rustic look and light washes of paint were used on his face to allow the beauty of the wood to show through. He is dressed in a cream linen shirt, wool pants, a jacquard cummerbund and a beautiful leather apron. This whimsical character comes with a toolkit and paint pots. 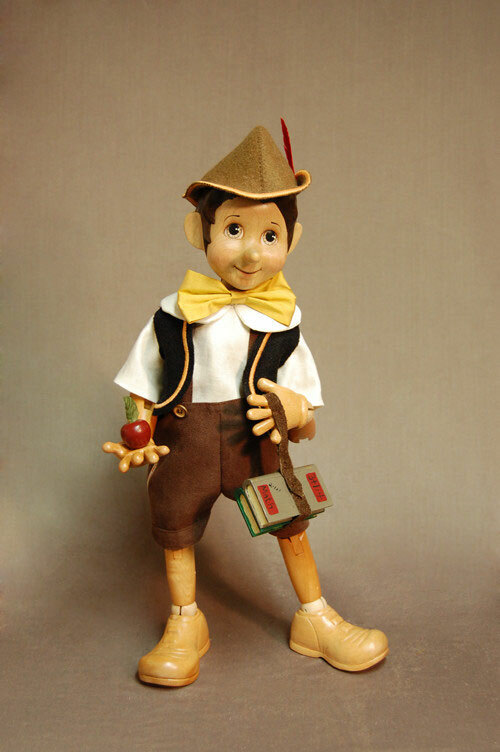 Pinocchio off to School: a slightly different version of the original but he is carrying an apple for the teacher and his school books. 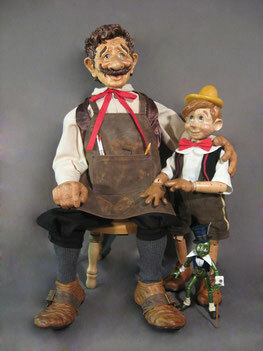 For 40" Geppetto & 24" Pinocchio Click on Photo. Stromboli the Circus Master. 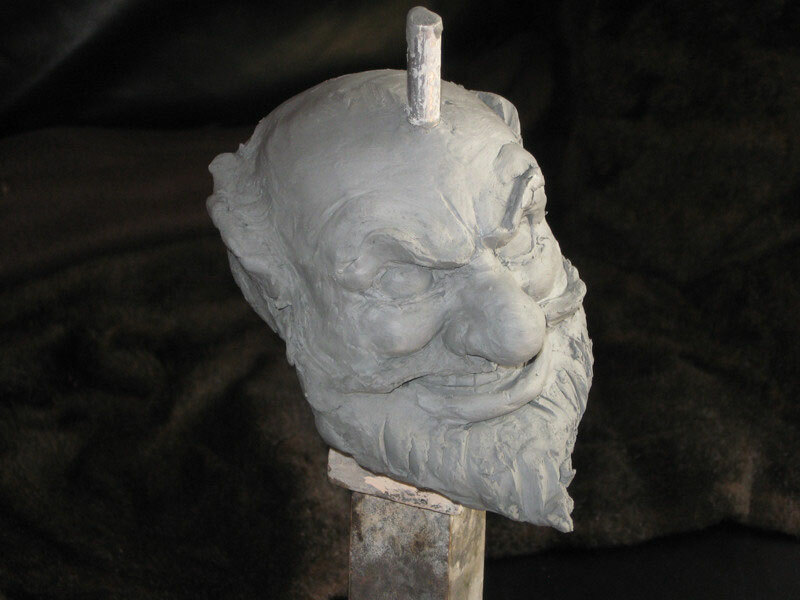 This is a photo of our original sculpt of Stromboli a new 24" piece which will soon be part of the 24" Geppetto and Pinocchio series. To inquire about this one of a kind creation, please contact us.